Gujarat temples exhibit a rich architecture, fine carvings and elegant statues that depict the historic value from the bygone eras. Apart from being religious centres, these temples witness thousands of tourists throughout the year. One of the finest contemporary Gujarat temples in India. It exhibits a blend of traditional sandstone carving with the latest technologies like fibre-optics, sound and light shows, multi-media and audio-visual events, among others. The temple is an important holy place in Gandhinagar and situated 2 km from the heart of the city. 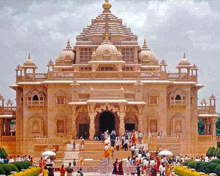 Also called as Akshardham temple. The temple has been constructed by the Bochasanwasi Akshar Purushottam Swaminarayan Sanstha (BAPS). BAPS is an organisation which operates by the Swaminarayan faith. It is a religious organisation formed in 1907 by Shastriji Maharaj. The temple is a beautiful edifice made out of pink stone. 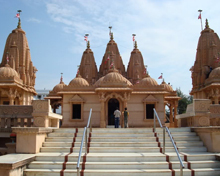 The Swaminarayan temple was opened to the public in 1992 and thousands of tourists flock every day to visit the temple. In the central hall of the temple, the idol of Lord Swaminarayan is set. The idol is fully covered with a gold leaf. The central hall also has idols of the successors of Lord Swaminarayan. These idols are marble idol and add beauty to the hall ambience. The temple looks grand with 100 pillars which are beautifully sculptured, the balconies are richly decorated, there is a podium and seventeen domes. There are two hundred windows in the whole edifice. 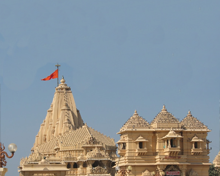 BAPS has built similar temples with grand architecture and unique constructions in Ahmedabad (four huge temples), Rajkot, Vadodara, Bhuj, Muli, Vadtal, Junagadh, Dholera, Dholka, Gadhpur, Burhanpur and Jetalpur in Gujarat. Swaminarayan temples have come up in many places in India. The temple committee, in fact, has raised hundreds of such grand Hindu temples across the world from Australia to the United States. It is associated with Goddess Amba and Lord Krishna. 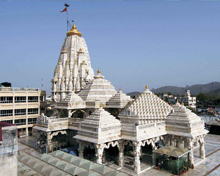 Ambaji is one of the most popular Hindu pilgrim spots. Tourists coming to Junagadh would be fascinated by its picturesque setting. The religious places and historical monuments of Junagadh attract many travellers from every nook and corner of the world. In the register of the holy places in Junagadh, the temple of Amba Mata stands out and merits a special mention. Owing to buses that ply frequently between Junagadh and other cities of Gujarat, one can reach the AmbaMata temple without any trouble. Junagadh temple is positioned on top of the Girnar Hill that is 600 metres in height. The presiding deity at this Hindu temple is Goddess Amba, an incarnation of the mother Goddess. Every year, thousands of pilgrims come to this temple to offer their prayers and seek divine blessings. This temple is especially a place frequented by the newly married couples who arrive at this place to be blessed by the Goddess. It is believed that the blessings of Goddess Amba would ensure eternal conjugal bliss for the couple. It is one of the four dhams (religious seat) of Hinduism. The other dhams are Badrinath-Kedarnath, Rameswaram, and Puri. Dwarka's mythical association with lord Krishna makes it one of the important Gujarat temples. The interesting history of the Dwarkanath temple states its five-storey tower was built by Sambha, the grandson of Lord Shri Krishna. The beautiful temple is made of limestone and sand. The exterior is supported by 60 columns. A soaring, richly carved spire could also be seen in the exterior part of this temple. A flag is hoisted at the temple tower everyday which welcomes the pilgrims by fluttering in the air beautifully. The structure of temple is quite complicated. This temple has two gateways namely Swarga Dwar and Moksha Dwar. Through the former, pilgrims enter while the later serves as the exit door for the pilgrims. Girnar is also known as Girnar Hill, Girinagar or Revatak Pravata. This place is a collection of mountains in the Junagadh district of Gujarat. The mountains are situated near Junagadh is at a distance of 327 km from Ahmedabad. Older than Himalayas, Girnar mountain and its range are considered sacred to both Hindus and Jains. A holy pilgrimage site, Hindus and Jains gather here during the Girnar Parikrama festival. Girnar Hill is famous among Shiva devotees for the mystic space-time of the mountain range. Hindu sadhus, babas, people from Nath sect, Jains visit Girnar, especially during the Maha Shivratri fair. 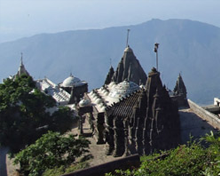 Girnar hosts a number of temples and some historical spots across its range. Amidst the lush green Gir forest, the mountain range serves as the hub of religious activity. The peak of Girnar is 3,660 feet high and is covered by Jain and Hindu temples. It is famous for its architectural splendour. It is one of the 12 Jyotirlingas of Lord Shiva. Somnath is one of the most important pilgrimage sites on the west coast of India. The small shore town of Somnath in Gujarat earns much of its claim to fame for being one of the most important pilgrim places in Gujarat. It lies in the confluence where River Saraswati is said to flow into the sea. According to Hindu mythology this is also the place where Lord Krishna was shot in the leg. 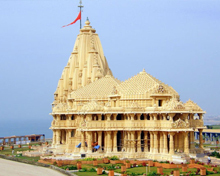 Somnath temple is one of the most frequented temples in the whole of India. It has an interesting legend about why and how it was built. It was built by the moon god or Soma in agreement to the curse that king Daksha put on him. He is said to have loved Rohini more than his other wives who incidentally were also Daksha's daughters. Due to the curse the moon began to fade and Daksha advised Soma to visit the Prabhas to get rid of the curse. Somnath etymologically mean the Lord of the moon. The history of Bala Hanuman temple and that of Jamnagar is interrelated at least as far as the essence of the place is concerned. Jamnagar is a city as well as a district belonging to the state of Gujarat. Historically, Jamnagar district was known as 'Nawanagar' (meaning the new city), which was one of the most important princely states of Saurashtra. In 1540 CE, Jamnagar was founded by Jam Rawal who was one of the rulers of the place. Today Jamnagar (meaning the city of the Jams) found its name from the hereditary title 'Jam' given to the rulers at that time. Located on the banks of the Sabarmati River, the Sabarmati Ashram was the residence of Mahatma Gandhi. Considered to be one of the focal points of Indian political struggle during the pre-independence period. The Sabarmati Ashram in Ahmedabad was the centre of many events that played major roles in during freedom struggle. Mahatma Gandhi made Sabarmati Ashram his home on 12 March 1930 and from here he sowed the seeds of non-violent revolution in the heart of millions of Indians. Mahatma Gandhi preferred this serene location on the banks of the Sabarmati River for a number of reasons. Firstly he felt it was his homeland and secondly Gujarat was the home of wealthy merchants who would be able to contribute in the freedom struggle. On the other side of the Sabarmati River were the iron gates of the prison while on the other shores Gandhisowed the seeds of freedom through non-violence. 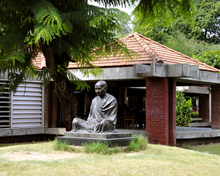 Mahatma Gandhi lived in the Sabarmati Ashram, Ahmedabad. One of the important tourist attractions of Ahmedabad it has still preserved important anecdotes, collectibles and letters of that period. On a tour to Gujarat, one can get a glimpse of the important documents and memorabilia of that period in the Sabarmati Ashram, Ahmedabad. One of the distinguishing features of the temples in Jamnagar is the fact that a good number of them belong to the Jain sect. These Jain temples in Jamnagar were built in memory of the lives of the various Tirthankaras (Jain saints). Another underlying motive behind the foundation of such temples is to spread the religion of Jainism to the rest of the world. 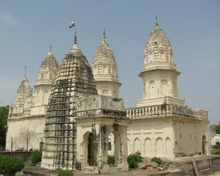 The Adinath temple, Jamnagar was built in memory of 'Adinath', who was the first Jain Tirthankara. All over the body of Adinath temple, Jamnagar, the life stories of the Tirthankaras are depicted by tableaux. The colours used in such forms of art like yellow, green, pink, orange and blue are usually blurred and indistinct. The murals also depict a wide range of flowers, Gods, people, and domestic objects which illustrate the stories even further. This mandir was built with the idea of spreading the religion ofJainism to the rest of the world. The temple was named after Shantinath who was the sixteenth 'Jain Tirthankara' (saints). The walls of Shantinath mandir are richly decorated with fine frescos as well as other wall paintings (murals), which illustrate the lives of various Tirthankaras. The life stories of these Jain saints are shown by the tableaux. The muddled hues of yellows, greens, pinks, oranges and blues depict a wide range of flowers, people, Gods, and domestic objects also add to their tales. The temple is one of the many such places of worship in Jamnagarwhose beauty and minute detailing in decoration has fascinated those who have visited it. Reaching Jamnagar is not a problem at all. The place can be reached by various modes of transport. There are regular flights to Jamnagar from Mumbai or Bhuj in Gujarat. Jamnagar is also connected directly with Ahmedabad and Mumbai through railway. Hapa Junction, which is 9 km from Jamnagar, is a convenient point to drop at. Moreover, Jamnagar is also connected by a good network of roads. Some other important towns in Gujarat temples having popular temples are Shamlaji, Vadnagar and Mahudi.